What happens when you mix two shviggers on a mission, a bumbling contractor, a cash-strapped husband, and a harried housewife who’s harboring a thirteen-year secret? It’s a recipe for disaster! 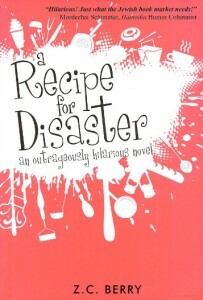 In this outrageously hilarious novel, fiction writer Z.C. Berry offers a refreshing mix of humor and wit that redefines the art of homemaking and money management. 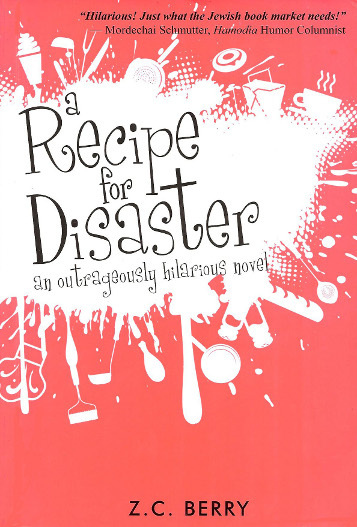 Starring an organizationally challenged, kitchen-phobic mom and her well-meaning but hassled husband, A Recipe for Disaster features their trials and tribulations as they attempt to keep their family afloat. Whether it’s Dudu the contractor who was supposed to “finish the job,” the ancient jalopy that has just taken its last breath, or a perfectionist mother-in-law, Tzippy, Izzy, and Co. have their hands full maintaining sanity as each disaster strikes. Z.C. BERRY’S favorite pastimes include reading, writing, and arithmetic (should I have two or three scoops of ice cream?). Z.C. has always been fascinated by humor, especially when not on the receiving end. Buy new clothes for kids. It couldn’t be anyone else. I hold the receiver away from ear. My mother doesn’t really believe that the tiny cell phone can carry her voice across the Atlantic, so she bellows into the receiver loud enough for everyone within a mile to hear. Which is fine, unless you’re sitting next to her on the subway, or walking with her in the grocery store or…anywhere really. I’m in the middle of folding laundry in my Jerusalem apartment. Did you ever try folding laundry while talking on the phone? You get a crick in your neck holding the phone between your ear and shoulder, and the phone keeps slipping anyway. You’re trying to concentrate on what the other person is saying, but all the time you’re hoping the phone won’t fall while you’re trying to fold the sheets into those perfect rectangles like your sister somehow does. It’s the baby. Oh, nuts. She should still be asleep now. “We’re coming for the bar mitzvah!” my mother blurts out. “What?” All thoughts of crying babies and laundry fly from my head. Suddenly I feel dizzy. I hang up the phone and brace myself on the back of the highchair. Then the baby falls silent, so I run to make sure she’s still breathing. She must have found her pacifier and put herself back to sleep. Looking at her, under her fuzzy, cotton-candy pink blanket, sucking contentedly, I feel myself calm down. Everything will be all right. Yes, everything will be just fine. But I was hoping they would bow out of this occasion. My parents can’t really afford to come for all of our simchahs, and the next bar mitzvah will be coming up in another year. So we decided that since Mona, my mother-in-law, would come to this simchah, my parents would come to the next one and bring a special gift for my oldest, Akiva, then. It’s the perfect way to keep Mona and my mother away from each other. Izzy’s mother is…well, different from mine. Not different in a two-headed-cow sort of way. She’s different in an English sort of way, even though she was born and bred in New York. Izzy’s mother is cultured. Mine is not. Izzy’s mother is always very polite and never really says what she is thinking (although I’m sure her thoughts are very benign). Ma always says exactly what’s on her mind. With the best intentions, of course. A few years back, Aunt Pearl redid her house in minimalist décor. Then she hosted the whole family for Pesach in her newly decorated abode. Everyone was very complimentary—it was kind of nice if you go for chrome and glass and lots of white. But in the middle of yachatz, my mother suddenly announced that she felt like she was sitting in a hospital ward. If we didn’t finish the Seder soon, she might have a heart attack. Later, I tried to explain to her that the décor was very fashionable. Ma got a hurt look on her face. “What did I say? I only meant she should add a little color, a few fluffy cushions.” She really thought she was being helpful. My mother-in-law, on the other hand, would have complimented Aunt Pearl with the rest of them. My wedding was almost a disaster. I say “almost” because we realized pretty quickly that we’d better keep the machateinestes apart if we wanted to get through sheva berachos. Don’t get me wrong. They don’t dislike each other. They are just not on the same wavelength. Like cats and dogs, like litvish and chassidish, like potato kugel and lasagna, like…well, you get the picture. To be honest, since my father-in-law passed away a few years ago, Mona has grown a bit…cantankerous. I don’t blame her. It’s hard to suffer a loss like that. But Mona and my mother clash worse than ever. The point is, we’ve somehow managed to keep my mother and Mona apart until now. I give a little shiver at the thought of them being at the bar mitzvah together. In the same room. Oy vey, my hands are shaking. I drop a pair of Gavriel’s pants, and a hundred marbles fall out of one of the pockets and roll off into the laundry room’s nether regions. Usually, that would drive me crazy. In a house full of boys, you find marbles everywhere—they clank in the drier, they clog up the drains, and once we even found a couple of marbles cooked in the cholent. But I can’t think about marbles now. I have bigger problems to contend with now. I’ll tell her that the bar mitzvah is canceled! Yes! People cancel parties all the time, don’t they? Even weddings sometimes! Yes, this is a good idea. No, that won’t work. You can’t cancel a bar mitzvah. He’s turning thirteen, come what may. I have to think of something else. Okay! Okay! I’ve got it! I dial my parents’ number. My mother answers. I take a deep breath. I stare at the phone, wondering what just happened. I was supposed to convince my mother that now is not the best time to come to Israel. That she would be much better off sticking to her original plan and waiting for Shaya’s bar mitzvah, which is in the summer, rather than Akiva’s bar mitzvah, which is in the beginning of the spring. It had something to do with global warming…or an ice age. Whatever. Anyway, with all her talk of sheitels and sacrifice, I just couldn’t do that to her. I need a doughnut break. It’s a good thing I stopped at the bakery this morning. I knew those doughnuts would come in handy. (See, Izzy? Doughnuts are not an extraneous expense.) I head for the kitchen and put the phone on the table. This is definitely a custard-filled, chocolate-covered moment. As I chew, I try to reconcile myself to my parents’ visit. I can’t tell my mother not to come now. And, after all, it is her first grandson’s bar mitzvah. How can I deprive her of taking part in the occasion? I swallow the last of the doughnut and go back to folding laundry. It will be all right. I’ve managed to deal with both sides of the family until now. This is just another challenge for me to overcome. My throat is suddenly dry. What has Ma done now? “Of course I’m still here. The sheitel macher isn’t finished yet! So, what do you think?” my mother asks. “Um…it’s a wonderful idea!” I manage. Okay, I’m sure you’re wondering what all the excitement is about. I should just say, “Thanks, Ma, but it’s too much for me,” and leave it at that. Or “Great idea, Ma! I’ll do it!” But it’s not that simple. You see, I hate cooking. And cooking hates me. We’re not exactly on talking terms. I could tell you about the time I burned the water (really) or the peanut-butter chicken incident (I promise I followed the recipe!). But some memories are best left undisturbed. I can open a jar of gefilte fish, and I’m a competent vegetable slicer. But a decent cook? No way. The thing is, Izzy doesn’t realize any of this. In fact, he sort of thinks I’m a great cook. And sometimes, he brags about how great my cooking is. I know. It sounds crazy. But it’s not as strange as you might think. The first year of our marriage I was expecting, so I didn’t have the strength to cook much. Izzy pitched in (more than he realized), and we ate a lot of falafel and pita with hummus. And jarred gefilte fish. And sliced vegetables and pickles. Izzy didn’t know that none of these foods actually requires any cooking. After that, Izzy went back to learning night seder, and then he started teaching. He eats most of his meals in yeshivah. And the kids seem to live fine on cereal with milk and jelly sandwiches. Shabbos is all takeout, which I buy from Klein’s Catering. I transfer the food into my own pots and pans to heat it up, and while I don’t go out of my way to conceal the fact that I don’t make the food, I don’t go out of my way to tell Izzy either. If he would look me in the eye and ask, “Tzippy, did you cook this food?” of course I would say no. But for some reason, he never asks me that. Every once in a while, I get into an “I’m-finally-going-to-learn-how-to-cook” frenzy. I’ll become a fantastic cook, I promise myself. World-class, even. I’ll take a course or beg Leah, my best friend, to show me the ropes. In a solemn voice, I’ll tell young newlyweds that I too—in some era long past—wasn’t always the master chef I am today. I’ll sympathize with all the pressures facing a young bride today. A young woman suddenly thrust into life, expected to run a household. Expected to live up to the daunting reputation of her perfect younger sister. Just for example. But somehow, whenever I try making a meal, it’s always a disaster. I just throw out the miserable concoction and go on with my life. I’m sure Izzy doesn’t need to know the gory details. Really, I’m just protecting him. Who wants his wife to be known as “Tzippy, the mediocre balabuste” or “Tzippy, the not-too-terrible cook”? And what about my mother-in-law? This is the first time Mona is coming for an extended visit—we’ve always gone to visit her. She thinks I’m the perfect balabuste. Oh, this is a disaster! I can feel the panic welling up. What am I going to do? Okay, Tzippy, think. Think! I chew on a doughnut crumb. Maybe the chocolate will get my mind working. And then, suddenly, the answer hits me. Maybe this isn’t such a bad idea after all. In fact, it might be the answer to all of my problems. If I cater the bar mitzvah, no one will find out that I can’t cook! Yes. This could work. I mean, really, what is the big deal? I just have this phobia about cooking, but it can’t be too hard. Everyone does it. There are cookbooks that tell you exactly what to do. It will be easy. I’ll just open up a cookbook and just…cook! Maybe this crazy idea of my mother’s will solve all of my problems. I will cater this bar mitzvah, everyone will think I’m a great cook, but now it will be true! Before I can finish dialing my mother’s cell phone number to tell her my decision, the phone rings again. What now? About fifty times. I’ve been trying to get hold of him for weeks. “How are you!” says Dudu, carefully enunciating each word. He loves speaking English. I hang up with a sigh of relief. At least something is going right. Now, what am I supposed to be doing now? Oh no! Supper! In all the excitement I forgot to heat up the meatloaf from Klein’s! Izzy is going to be home soon, and even though he eats supper in yeshivah, he likes to eat a little something when he gets home. I dump the meatloaf into a Pyrex dish and stick it in the oven when I hear the door handle turning, then a knock. I must have left on the safety lock. Quickly, I gather the bags with the Klein’s logo and stuff them deep into the trash. I paste a smile on my face, trying to look tranquil, and glance at the hallway mirror. When I’m at my best, the clear blue eyes, the slight spray of freckles and my small, upturned nose have a sort of cute effect. But now, all I see is a woman who has just been to the dentist for a root canal. Steadfastly ignoring the first signs of crow’s feet that have formed at the corners of my eyes, I hurry to open the door to let him in. Maybe I should tell him I didn’t cook the meal. Maybe I should just finally tell him the truth. I bite my lip. Izzy did just come home from a long day, and he looks so tired. And didn’t I just hear in that shiur the other day that you’re not supposed to bombard your husband with the details of your day when he first arrives home? Yes, it wouldn’t be nice. Tomorrow I’ll tell him everything. Izzy goes into the living room to put away his hat and briefcase and then comes into the kitchen with the mail. While he sits at the table opening envelopes, I take out a plate, cutlery, and napkins and place them on the table. Oops! Usually I take care of the bills, but I forgot that Izzy asked the caterers to mail him an invoice so he could keep a record of bar mitzvah expenses for the next one. I didn’t realize they would put my running total together with the new bill. “Speaking of caterers, my mother had an interesting idea,” I say quickly. “Oh? What’s that?” He opens the fridge and pulls out up the ketchup, then sits back down to make himself a meatloaf sandwich. I take out the lettuce and start shredding. “Oh, for a long time,” I say, waving my hand absently. Thirteen years, to be precise. Ever since I started using them for my “homemade” suppers. Izzy’s eyes go wide, and he freezes. Then he carefully puts down the knife and the ketchup and looks up at me. “How nice,” he says at last. I bite my lip and nod. Izzy is quiet for a moment. I can almost see the gears turning in his head. He fingers the bill from the caterers and looks down at it with a frown, almost as if he had forgotten about it and suddenly got a nasty surprise. He looks back up at me. “Fine. Now, I’d better get cracking if I’m going to take this on. Don’t worry, Izzy. This is going to be the best bar mitzvah we’ve ever made!” I give him a big smile. “That’s a great idea.” If my voice is a little wavery, Izzy doesn’t seem to notice. I say good night and turn to the dishes. When I hear the sounds of Izzy getting ready for bed, my already unsteady composure crumbles completely. I close my eyes and bury my face in soapy hands. Oy vey! What have I done?